Why has Di Matteo chosen this formation? For years, Chelsea’s success hinged on a tough, solid defensive team with good attacking capability. However, with the post-Champions League makeover, and the smaller, more technically advanced players brought in, things had to change. In keeping with traditional Chelsea values, there remains a strong defensive base to the team, with the back four and the two holding midfielders ready to snuff out opposing attacks. But in front of the two holding midfielders the three playmakers reside, supporting the lone striker. This setup allows Di Matteo to utilize fully the creative talents of his new midfielders, giving them free reign in the final third, while giving them a stable platform from which to work without having to worry about the defensive side of things should they give the ball away. As previously articulated, the main strength is the way it allows Chelsea’s trequartistas the freedom to boss the opponent’s half, keep possession well, with a view to playing an incisive final ball. Nevertheless, that is not its only strength. As the main strength of the new midfield is in passing the ball, 4-2-3-1 allows the Blues to pack the centre of the park with players, giving them dominance in that area. The holding midfielders, but in particular Obi Mikel, play the role of distributors should the front four come under undue pressure, and can switch the play to the other side of the pitch quickly. This is part of the reason that Chelsea usually take the lion’s share of possession in their matches. The full backs also provide width and directness to the attack, barrelling down the flanks to aid an otherwise unduly central trio of master passers. They work well on the overlap, and are more than capable of helping out the striker in the finishing department, especially Ivanovic, who has netted an impressive number of goals already this season. This willingness to push forward from the full-backs is useful in attack, but can leave the Chelsea back line vulnerable to pacy counterattacks down the wing. When hit hard and fast on the counter, often leaves only the centre backs, the full-back on the opposite side, and if fortunate, John Obi Mikel, who strongly dislikes going forward. 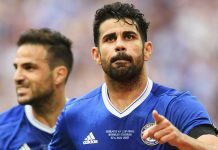 As Chelsea have encountered several times in the league, notably against Stoke and QPR, sides not normally able to match Chelsea toe for toe will instead simply pack the midfield with players, knowing that even though the full backs will arrive down the sides, Chelsea’s three attacking midfielders are at heart all No. 10s, with only one of them allowed to play in that role; the three therefore have a tendency to bunch close together and stay away from the flanks. With the reduction in space that the Oscar, Hazard and Mata have in this situation, it becomes much harder to find space to pick a pass. How have Chelsea’s personnel influenced the formation? The choice of players, and their strengths and weaknesses, will always have a bearing on the tactics of a team, and Chelsea are no exception. First of all, the holding midfielders, especially Ramires and Lampard, are more than just glorified defenders. They provide an essential bridge between the three behind the striker, and help to transition play between defence and attack. If the two DMs were both like Obi Mikel, who has yet to score a goal for Chelsea, the ball would simply bounce back and forth around the defence for 90 minutes. Instead, Chelsea can swiftly shift into the speedy counterattack with the help of the energetic runs of Ramires, or the visionary passing of Lampard. The second major influence is the three attacking midfielders’ unwillingness to defend. This necessitates the strong holding midfielders and back four. Their second taboo, that of working down the flanks, is what makes for the prominence of Chelsea’s excellent attacking full-backs in Ivanovic and Cole. To finish off, Chelsea’s new formation has been built to play to the utmost strengths of our new attacking triple threat, while staying in line with age-old Chelsea values of strong defensive play. It seems to be the best way for Chelsea to set up, but who knows what goes on inside Di Matteo’s head? Definitely not me. KTBFFH!